Important: If you wish to continue to receive this free newsletter and alerts, please sign up HERE. Thank you. IDAHO GOVERNOR SELLING HIS STATE TO THE CHINESE? Important: If you wish to continue to receive this free newsletter and alerts, please sign up at the bottom of the page. Thank you. WHY IS HUGO CHAVEZ INVOLVED WITH U.S. VOTING MACHINES? "...thanks to Virginia conservatives, there's still hope. And we should thank people like Tricia Stall for getting us back on track." 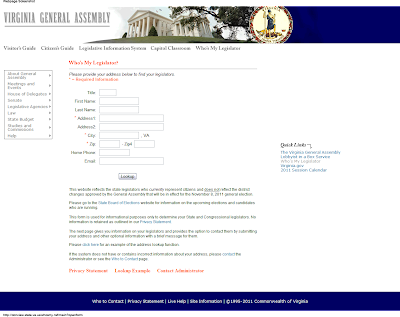 Welcome to the Virginia General Assembly - Who's My Legislator? Issue 135 - Are Electronic Voting Machines Fixing Elections? If you wish to unsubscribe please go to the bottom of this e-mail. I wanted to update you on the 6th Circuit's appellate ruling in the healthcare case. There are a lot of nuances to the ruling, so let's start at the beginning and go through them one at a time. Before I begin, I need to offer a disclaimer. The way this case was decided, it ended up being very complex - so please bear with me. Remember that in an ordinary appeal (not to the Supreme Court), three judges sit together to decide the appellate case.